Spotlight your company’s innovations and emerging technologies with a 30-minute presentation in the Knowledge Hub's Innovation Zone or Disruption Zone. The Innovation Zone will focus on using your expertise to identify solutions to current challenges and feature breakthrough ideas. The Disruption Zone will help attendees to identify and implement disruptive technologies to meet consumer demands and changing industry practices. Both of these exclusive venues will provide you with a powerful opportunity to establish yourself as an industry leader, innovator, and expert, as well as leave new and existing business contacts with great new ideas. To apply, use the link below to submit a 200-word abstract highlighting your key content and how it could benefit ProFood Tech attendees. Please include a presentation title, speaker information, and billing contact information. The cost for accepted presentations is $3,000, and the deadline for submissions is January 18. PMMI will host an information-packed webinar today, January 16 at 2:00 pm EST, with information about the Customer Invite Program. Learn how to increase traffic to your exhibit with the complimentary Customer Invite Program pre-show marketing tools. If you attend this webinar, you will be entered into a drawing to win a $25 Starbucks gift card! The winner will be announced on the ProFood Tech Facebook page. The webinar will provide an overview on comp code usage though our new vendor, VIP Guest Invites. PMMI will be publishing company name, booth number, full physical address, phone number, website and company email address for the ProFood Tech Show Guide which will be distributed to all attendees and exhibitors at the show. It is critical for you to login to the Exhibitor Dashboard to review and approve your data prior to the publication of the Show Guide. The deadline is Friday, February 8, 2019. Enter your exhibitor ID and password that are listed in the header of this update. Select "Exhibitor Directory Listing" – the top left tile. Review the details in the “Company Information” box to ensure the data is correct for those fields that will be published (company name, division, address, city/town, state/province, postal code, country, telephone, company email, website). If you need to make an update to this information, you must email expo@pmmi.org with the updates that should be made. These fields are not editable through the Exhibitor Dashboard. Once your data is reviewed, click “Approve Data” at the top of the screen. If data is not reviewed and approved by the February 8 deadline, PMMI will use the data we have on file to populate in the printed Show Guide. While logged into the dashboard, be sure to also complete your company description, vertical markets, product categories, press releases, show specials and more. The online directory is the ONLY place this information will appear and it is how attendees and media will plan who they will visit at the show. If you have any questions, please contact the PMMI Show Department at 571.612.3200 or expo@pmmi.org. The discount deadline for ordering services is Monday, February 18. Finalize your order with payment by Monday, February 18 to receive 30 percent off most items. Please contact Phillip Ramirez, The Expo Group Service Team Manager at 972.751.9416 or pramirez@theexpogroup.com with any questions about ordering your booth services. Guaranteed lowest hotel rates have been negotiated exclusively for ProFood Tech attendees and exhibitors. All reservations are confirmed on a first-come, first-serviced basis. Expovision is the official Hotel Reservations Office and offers the guaranteed lowest rates and availability at the most popular and convenient hotels in Chicago. Book in the official room block for the guaranteed lowest rates! Take the shuttle to-and-from your hotel and McCormick Place! ProFood Tech has aligned with various travel providers to offer you travel discounts to help getting to Chicago easier and cheaper. Airline and car rental discounts are available for travel from March 23-31, 2019. Want to increase your booth traffic at ProFood Tech? Let your customers know that you’re exhibiting! 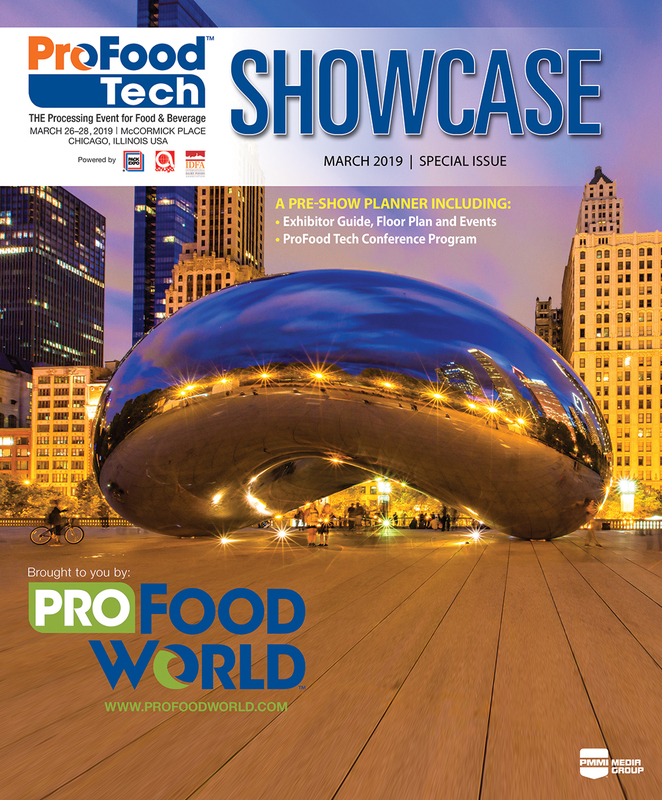 Be included in the ProFood Tech SHOWCASE pre-show planner, mailed to 25,000 food and beverage manufacturing professionals, including show pre-registrants. The deadline for submissions is Friday, February 1.